HANNUKAH falls early this year, beginning on Thursday, November 28th. This eight-day celebration is also called 'The Festival of Lights'. The holiday celebrates the reclaiming of the Holy Temple, and has many traditions associated with it, from eating certain foods, to the lighting of the mennorah, to specific gifts given during the celebration. **A lovely centerpiece can grace the dining room table. Traditionally, white, blue and silver are the colors used for this celebration. 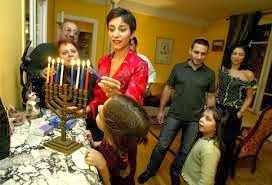 Do not include candles, so as not to take away from the importance of the menorah. ** Floral arrangements that reflect the recipient's home are great gifts as well. If you do not know the color scheme inside her home, stick with the traditional white and blue palette, such as Cactus Flower's exclusive Boy OhBoy Bouquet. 1. Do not send anything that conveys traditional Christmas holiday, such as red and green arrangements, or things including red and white striped candy canes, ornaments, crosses or other religious items. 2. If sending a plant, stay away from poinsettias and anything pine or Christmas-tree shaped. 3. Make sure that when placing the order you mention it is a Hannukah gift. If it is being delivered on a Friday, it must arrive before sundown for Shabbat.